Just add 12 to the basket and the special price of £4 will be charged. 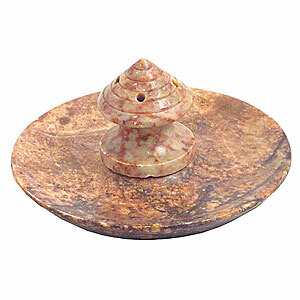 A simple but very effective Soapstone Incense Holder - Fountain (height 4cm x diameter 8cm). The ideal incense holder for burning incense sticks or cones safely. The incense holder has a smooth natural soapstone finish base and lays flat for burning. It conveniently protects your furniture when burning the incense. Your customers will find it very easy to use. Available individually or in a money-saving box of 12.